As with other blood products, umbilical cord blood banking requires special attention and procedures to ensure its safety and viability for possible future use. The science of cryogenics (freezing something in nitrogen under controlled conditions) has truly transformed regenerative medicine by enabling long-term storage of blood products in anticipation of need, as opposed to, waiting until there is a medical emergency at hand. It’s important when selecting a cord blood storage facility to be assured that the facility you choose, whether private or public, is accredited by the American Association of Blood Banks (AABB) as well as lawfully registered with the FDA. You also need to be sure, if dealing with a private facility, that the facility is financially sound. A bankruptcy by a private company could put your cord blood in jeopardy. Looking now at the actual process, you need to start by making arrangements before delivery, for the umbilical cord blood to be collected. If using a public cord blood bank, you should understand that the cord blood storage process is more stringent. It is estimated that as many a 50% of all donations are ultimately rejected for long-term storage. This can be either due to an insufficient amount of blood being collected (cord blood unit must be at least 75 mL), or due to the presence of a contamination. Next, the mother must undergo a pre-screening for communicable diseases and disorders. In some cases, the baby might be tested as well. If approved, the next steps will occur within 15 minutes of the baby being born. The process: 1) the umbilical cord is clamped, 2) the blood is drawn out into the sterile storage bag (now referred to as a ‘cord blood unit’), 3) it is moved to the storage center for further processing, 4) It is tested for contamination and measured to be sure there is enough blood-forming cells for a transplant, 5) The cord blood unit is tissue typed for genetic matching down the road, 6) Finally it is cryogenically frozen for indefinite storage. This process is largely the same whether using a private or public cord blood bank. With a private cord blood bank; however, the cord blood unit is pre-labeled with a special identification number assigned to the child, as well as other required information for the exclusive use of the child or their family. Unlike with a public registry, the identifying information remains with the unit throughout storage. This ensures easy retrieval when needed by the child or family member. When using a public cord blood bank all identifying markings are erased from the cord blood unit ensuring complete anonymity. 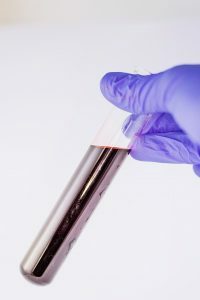 Once the blood has arrived at the cord blood storage facility it is tested and matched for HLA (Human Leukocyte Antigen, the marker that identifies the donation’s unique genetic characteristics that enable it to be matched with a recipient). It is also checked for contamination and sufficient blood cells to use in a transplant. If it does not pass either of these tests the cord blood unit will either be used in research or discarded. Assuming all the tests go well, a cryopreservative is then added to the blood to help the cells survive the cryogenic freezing process. The blood is then cooled slowly to -97 degrees Celsius, which is necessary to maintain cell life. It is then placed in a liquid nitrogen tank which drops the temperature of the cord blood unit to a consistent -196 degrees Celsius. Some cryogenic preservation methods also use a substance called DMSO (dimethyl sulfoxide) to slow and control the cooling rate as well as to help with the thawing process. Current research estimates that 1 out of 3 Americans today may need to use the regenerative medicine at some point in their lives. Thanks to the miracle of cryogenics we now have a way to offer the benefits of cord blood storage for the future.